A new video has emerged from TGS 2013 showing Shuhei Yoshida, President of Sony’s Worldwide Studios, demonstrate the PS4’s companion application on a Sony Xperia Z. 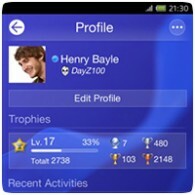 The application lets you view friends’ activities, trophies and stream gameplay videos on the go. The app also features a “Connect to PS4” button, that lets you use the mobile device as a second screen. The video shows the mobile app working with Play Rooms, allowing you to draw something on the device and sent it to the PS4 for the bots to interact with. Multiplayer games will allow you to send invites to friends, and Facebook and Twitter integration is also promised alongside information pages for all the PlayStation 4 games.